I recently came across a website regarding European Migration Patterns which I found interesting. The website useful links for those researching their ancestry out of the United States. Although this site does not have any active databases to search, it provides one with links to other searchable databases of various countries in Europe including Denmark, Sweden, Finland, Norway, Scotland, and Italian to name a few. 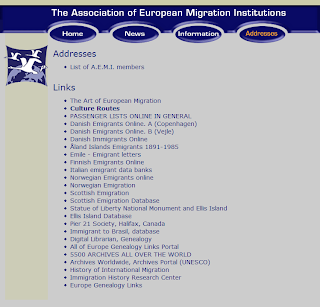 If you would like to learn more about this site click The Association Of European Migration Links.